Text by Corrine S. Borton. Photos by Mallory Beinborn, Kelly Barnes & Ruehl Photography. Ad Courtesy of In Stride Magazine..
His own show career has been nothing short of remarkable and with only seven foal crops on the ground it’s clear Extremely Hot Chips is going to be a powerhouse sire. 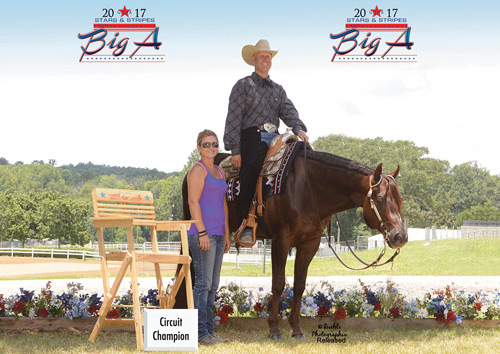 Since purchasing the 2006 chestnut stallion by Blazing Hot and out of Miss Trophy Chip (by Zips Chocolate Chip) in 2012, Russ Louderback, Fishers, Indiana, has done things his way. When his critics insisted that he had nothing left to prove, Louderback brought Chip back to the show pen year after year. When people ask Louderback why he continues to show his horse his answer is simple. Louderback also likes people to see what he sees in Extremely Hot Chips. Besides, in the show pen, Extremely Hot Chips never disappointed, always placing in the Top 10 at the big shows, like the Quarter Horse Congress. Extremely Hot Chips has 221 American Quarter Horse Association Open and Amateur points and has recorded over $84,000 himself in earnings. He’s an AQHA High Point Western Pleasure Stallion and placed third at the AQHA World Show in Junior Western Pleasure. Chip is also a National Snaffle Bit Association World Champion and Breeders Championship Futurity Champion. He comes from a long line of great horses and that’s what makes him so special,” said Joan Schroeder. “His bloodline is four generations of greatness. He is a Quarter Horse Congress Champion and Reserve Champion and has numerous futurity titles to his name. But Louderback has decided 2017 will be Chip’s final year of competition. Just days after his final collection for 2017, Extremely Hot Chips was sent to Jay Starnes to prepare for his swan song in the show arena. “I got him just before the Tom Powers Futurity and he has been great to show,” Starnes said. “He is just so good minded.” Starnes rode Extremely Hot Chips to Top 5 honors in the Open Pleasure Maturity there and then it was off to the Big A Circuit in Perry, Georgia where Jay and Extremely Hot Chips were Circuit Champions in Senior Western Pleasure. In August, they placed fourth in Senior Western Pleasure at the NSBA World Show. Starnes will show Extremely Hot Chips in Senior Western Pleasure and the Open Maturity Western Pleasure at this year’s Congress and Louderback will show him in Amateur Western Pleasure. Then it’s on to the AQHA World Championship Show here Senior Western Pleasure will most likely be his final class of competition. Starnes said Extremely Hot Chips’ strength is in his mind. “It also helps that he is a great loper and can really jog,” he said. Louderback is looking forward to watching his stallion finish out his extraordinary show career with Starnes in the saddle and is appreciative of all the trainers who along the way have had a part in his success. It will be a bittersweet time for everyone who has been involved with all the people who have been involved with him over the years…. but especially for Louderback. 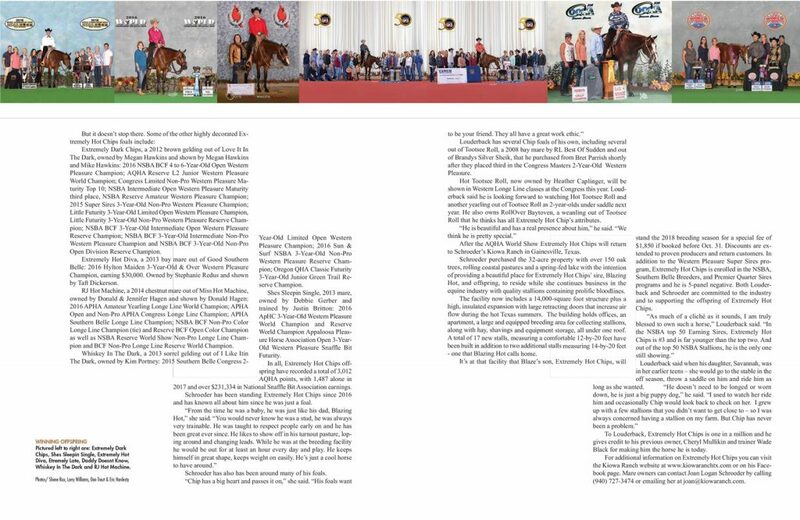 Joan Schroeder, who owns and stands Extremely Hot Chips’ sire, Blazing Hot at her Kiowa Ranch in Collinsville, Texas, said his success in the show pen and as a sire is no accident, but rather result of calculated breeding for four generations. Schroeder explained that those sires that have made the biggest impact in our industry have been ones who had great dams. 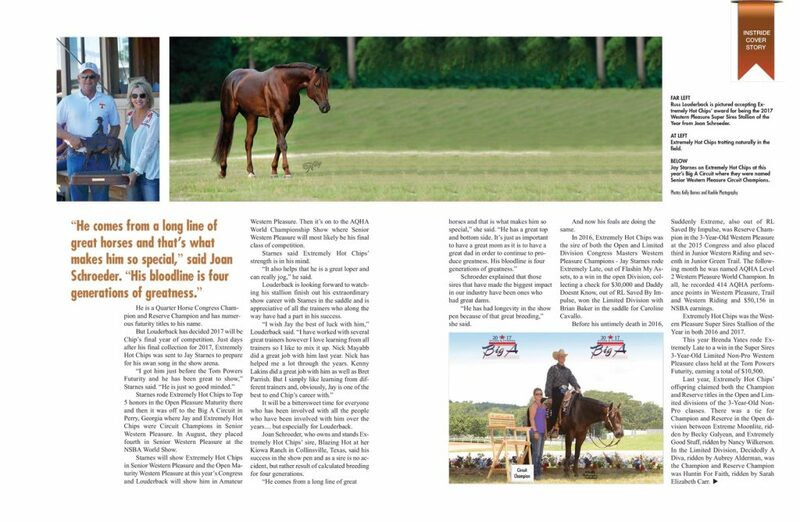 “He has had longevity in the show pen because of that great breeding,” she said. And now his foals are doing the same. In 2016, Extremely Hot Chips was the sire of both the Open and Limited Division Congress Masters Western Pleasure Champions – Jay Starnes rode Extremely Late, out of Flashing My Assets, to a win in the open Division, collecting a check for $30,000 and Daddy Doesn’t Know, out of RL Saved By Impulse, won the Limited Division with Brian Baker in the saddle for Caroline Caballo. Before his untimely death in 2016, Suddenly Extreme, also out of RL Saved by Impulse, was Reserve Champion in the 3-Year-Old Western Pleasure at the 2015 Congress and also placed third in Junior Western Riding and seventh in Junior Green Trail. The following month he was named AQHA Level 2 Western Pleasure World Champion. In all, he recorded 414 AQHA performance points in Western Pleasure, Trail and Western Riding and $50,156 in NSBA earnings. Extremely Hot Chips was the Western Pleasure Super Sires Stallion of the Year in both 2016 and 2017. 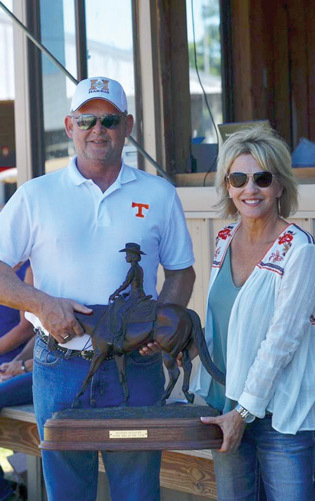 This year Brenda Yates rode Extremely Late to a win in the Super Sires 3-Year-Old Limited Non-Pro Western Pleasure class held at the Tom Powers Futurity, earning a total of $10,500. Last year, Extremely Hot Chips’ offspring claimed both the Champion and Reserve titles in the Open and Limited divisions of the 3-Year-Old NonPro classes. There was a tie for Champion and Reserve in the Open division between Extreme Moonlite, ridden by Becky Galyean, and Extremely Good Stuff, ridden by Nancy Wilkerson. In the Limited Division, Decidedly A Diva, ridden by Aubrey Alderman, was the Champion and Reserve Champion was Huntin For Faith, ridden by Sarah Elizabeth Carr. Extremely Dark Chips, a 2012 brown gelding out of Love It In The Dark, owned by Megan Hawkins and shown by Megan Hawkins and Mike Hawkins: 2016 NSBA BCF 4 to 6-Year-Old Open Western Pleasure Champion; AQHA Reserve L2 Junior Western Pleasure World Champion; Congress Limited Non-Pro Western Pleasure Maturity Top 10; NSBA Intermediate Open Western Pleasure Maturity third place, NSBA Reserve Amateur Western Pleasure Champion; 2015 Super Sires 3-Year-Old Non-Pro Western Pleasure Champion; Little Futurity 3-Year-Old Limited Open Western Pleasure Champion, Little Futurity 3-Year-Old Non-Pro Western Pleasure Reserve Champion; NSBA BCF 3-Year-Old Intermediate Open Western Pleasure Reserve Champion; NSBA BCF 3-Year-Old Intermediate Non-Pro Western Pleasure Champion and NSBA BCF 3-Year-Old Non-Pro Open Division Reserve Champion. Extremely Hot Diva, a 2013 bay mare out of Good Southern Belle: 2016 Hylton Maiden 3-Year-Old & Over Western Pleasure Champion, earning $30,000. Owned by Stephanie Redus and shown by Taft Dickerson. RJ Hot Machine, a 2014 chestnut mare out of Miss Hot Machine, owned by Donald & Jennifer Hagen and shown by Donald Hagen: 2016 APHA Amateur Yearling Longe Line World Champion; APHA Open and Non-Pro APHA Congress Longe Line Champion; APHA Southern Belle Longe Line Champion; NSBA BCF Non-Pro Color Longe Line Champion (tie) and Reserve BCF Open Color Champion as well as NSBA Reserve World Show Non-Pro Longe Line Champion and BCF Non-Pro Longe Line Reserve World Champion. Whiskey In The Dark, a 2013 sorrel gelding out of I Like It in The Dark, owned by Kim Portney: 2015 Southern Belle Congress 2-Year-Old Limited Open Western Pleasure Champion; 2016 Sun & Surf NSBA 3-Year-Old Non-Pro Western Pleasure Reserve Champion; Oregon QHA Classic Futurity 3-Year-Old Junior Green Trail Reserve Champion. Shes Sleepin Single, 2013 mare, owned by Debbie Gerber and trained by Justin Britton: 2016 ApHC 3-Year-Old Western Pleasure World Champion and Reserve World Champion Appaloosa Pleasure Horse Association Open 3-YearOld Western Pleasure Snaffle Bit Futurity. In all, Extremely Hot Chips offspring have recorded a total of 3,012 AQHA points, with 1,487 alone in 2017 and over $231,334 in National Snaffle Bit Association earnings. Schroeder has been standing Extremely Hot Chips since 2016 and has known all about him since he was just a foal. Louderback has several Chip foals of his own, including several out of Tootsee Roll, a 2008 bay mare by RL Best of Sudden and out of Brandys Silver Sheik, that he purchased from Bret Parrish shortly after they placed third in the Congress Masters 2-Year-Old Western Pleasure. 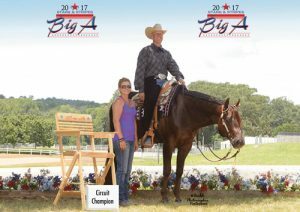 Hot Tootsee Roll, now owned by Heather Caplinger, will be shown in Western Longe Line classes at the Congress this year. Louderback said he is looking forward to watching Hot Tootsee Roll and another yearling out of Tootsee Roll as 2-year-olds under saddle next year. He also owns RollOver Baytoven, a weanling out of Tootsee Roll that he thinks has all Extremely Hot Chip’s attributes. After the AQHA World Show Extremely Hot Chips will return to Schroeder’s Kiowa Ranch in Gainesville, Texas. Schroeder purchased the 32-acre property with over 150 oak trees, rolling coastal pastures and a spring-fed lake with the intention of providing a beautiful place for Extremely Hot Chips’ sire, Blazing Hot, and offspring, to reside while she continues business in the equine industry with quality stallions containing prolific bloodlines. The facility now includes a 14,000-square foot structure plus a high, insulated expansion with large retracting doors that increase air flow during the hot Texas summers. The building holds offices, an apartment, a large and equipped breeding area for collecting stallions, along with hay, shavings and equipment storage, all under one roof. A total of 17 new stalls, measuring a comfortable 12-by-20 feet have been built in addition to two additional stalls measuring 14-by-20 feet – one that Blazing Hot calls home. It’s at that facility that Blaze’s son, Extremely Hot Chips, will stand the 2018 breeding season for a special fee of $1,850 if booked before Oct. 31. Discounts are extended to proven producers and return customers. In addition to the Western Pleasure Super Sires program, Extremely Hot Chips is enrolled in the NSBA, Southern Belle Breeders, and Premier Quarter Sires programs and he is 5-panel negative. Both Louderback and Schroeder are committed to the industry and to supporting the offspring of Extremely Hot Chips. To Louderback, Extremely Hot Chips is one in a million and he gives credit to his previous owner, Cheryl Mullikin and trainer Wade Black for making him the horse he is today. For additional information on Extremely Hot Chips you can visit the his website or on his Facebook page. Mare owners can contact Joan Logan Schroeder by calling (940) 727-3474 or emailing her.